Here are some great Kenya safari photos. For many, going on a safari is the main reason for visiting Kenya. The word safari triggers images of endless plains, seeing lions stroll through the grass, and camping in the wild – and after seeing these dramatic safari images you may understand why… At the bottom, you'll find links to more Kenya pictures. 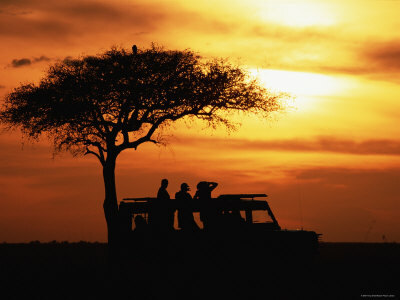 Above: Experiencing a sunset in Masai Mara National Reserve in Kenya. 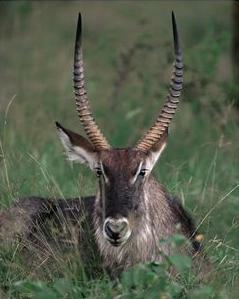 Above: A waterbuck in one of the national parks. They are especially present in the Lake Naivasha region, in savanna and scrub areas where they can eat grass. 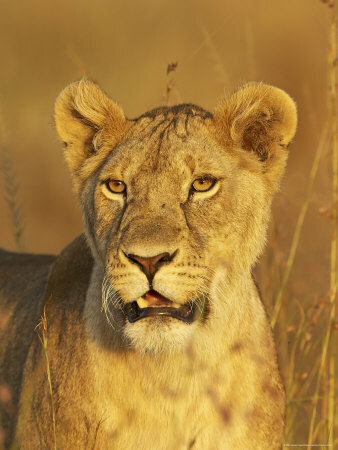 Above: A lioness in Masai Mara National Reserve. Lions in Kenya are endangered, also because tribes like the Masai have rituals in which a Masai warrior has to kill a lion to prove his strength. It’s illegal, but it’s still practiced. 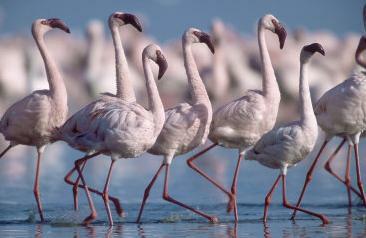 Above: Greater flamingos in Lake Nakuru National Park. There’s normally a huge flamingo population there and it’s a real spectacle to see them at the lake. However, big differences in the water levels – from floods to droughts – make them go away en masse sometimes. 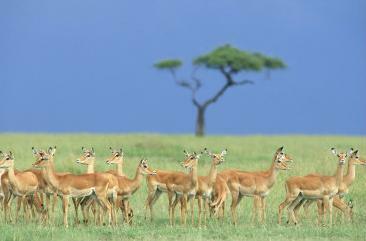 Above: Impala at Masai Mara National Reserve. They are very common in the Kenyan national parks. Though they adapt to different environments, they especially like the savanna. 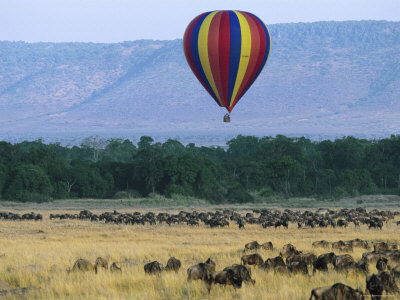 Above: Doing a ‘balloon safari’ (actually a trip of a few hours) over one of the national parks is increasingly popular. These trips depart around sunrise, when most animals are awake and you’ll have a great view while gliding over them. This picture was again taken at Masai Mara. Above: A crocodile attacks a herd of wildebeests during the annual Wildebeest Migration. 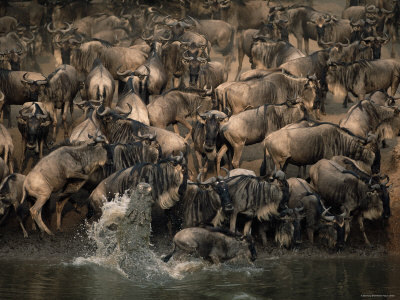 Each year around August-September, around a million of wildebeest make their mysterious big circle from the Serengeti plains to the Masai Mara and back again. 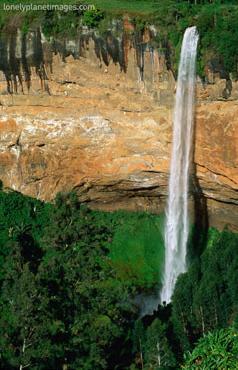 Above: The Sipi Falls in Mount Elgon National Park. If you’d like to have a national park practically all to yourself, this park is one of the best options. Despite it’s stunningly beautiful scenery, most mountain hikers are more interested in being able to say that they climbed Mount Kenya (the biggest mountain in the country). 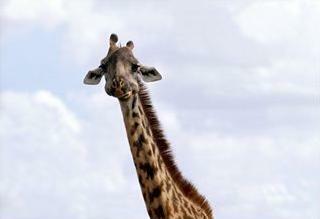 Above: A giraffe at Nairobi National Park, the wildlife resort that’s located just around the huge city of Nairobi. It’s a full wildlife resort with a surprising variety of animals, and really underrated. 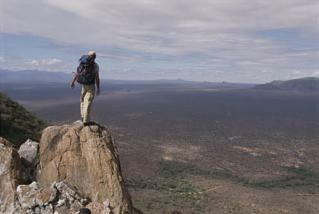 Above: The view over Tsavo West National Park. Tsavo East and West are together by far the biggest parks of Kenya. Together they are the size of the US state of Massachusetts. I hope these Kenya safari photos were of use to you. All images have been provided in association with Allposters.com, who have the best selection of Kenya safari photos available on the internet in my opinion.